Reading on a Rainy Day: Announcing our little secret: There's a bun in the oven! Announcing our little secret: There's a bun in the oven! I've been composing this post in my head for months and wanted to just shout it out so many times - sometimes even while commenting on some of your posts. When I stayed offline for most of December, when I was complaining of feeling lethargic and unmotivated, or when I was reading similar posts on at least three other blogs, it took all my willpower to just keep a straight face, figuratively speaking. But the time has finally come and I can say it, nay shout it. I'm about three and a half months along, and well into enjoying my second trimester. My first wasn't terribly bad - I was nauseated all day long, right after breakfast until I hit the sack. There was not much I could bring myself to eat. I couldn't open the refrigerator without pinching my nose, or I will be gagging for some time after. I couldn't eat chicken, and even now, I am very picky about how my chicken is cooked, thanks to memory by association. Even the pregnancy book I started reading around the time my nausea started got chucked into a corner, because everytime I see that book, I remember those horrible days of nausea. (I will need another book now.) But at least I didn't get sick, and I try to be grateful for that. Still, by the end of my first trimester, I had lost five pounds. Now, I am more than happy to eat anything. I've been slowly picking up all those lost pounds and only just got on the positive side of the weight gain. I haven't been having any other symptoms though, other than a recurring hip pain that has bothered me for years. I would love to get some cravings, just to know what I will crave for, but so far, nothing, nada, zilch. There's still plenty of time. July is so far away! We had our first ultrasound last month and it was so emotional watching the baby wiggling and dancing about. Let me tell you what I used to think of ultrasounds. I had always felt them to be weird. When a friend shows me the sonogram, all I'm seeing is a grainy picture with various shapes, and sometimes, okay, most times, I cannot make out which the baby is or where the body is. I was prepared for a similar reaction to my ultrasound. And then the baby did its cute little wiggling. Honestly, I am now a convert. I had to see my own ultrasound to get there. And then when the technician caught the heartbeat, I was just a blubbering mess who couldn't comprehend the miracle happening inside me. My husband had missed being at the ultrasound, since he was away in India, but we just went for our follow up last week, and he was similarly amazed on hearing the heartbeat. I'm now allowing myself to relax and not get too worked up about the odds of things going wrong. We had already told our family within minutes of the pregnancy test glowing positive. Of course, there was no way we could do any big surprise announcement with them, since they have been sighing about grandkids since forever. We've told many of our close friends too, and decided now is the best time to go public. We still don't know whether it's a boy or a girl, and it may be another 6-8 weeks before we get that information. But we already got our first baby-gifts, when my parents sent some baby blankets, and our best friends gave us their infant car-seat. We won't be shopping much yet, but I have already been thinking about the nursery, which room to remodel, and what colors I want to use. When the nausea hit me full-time, I couldn't wait to fast forward nine months and have the baby, just so I wouldn't have to deal with the nausea, but now that I feel so much better and have been feeling quite energetic, especially in the mornings, I am happy to take this slow. For now, I just want to relish this experience. Congratulations!! What an exciting time - so happy for you! Oh, wow, what wonderful news! A million congratulations to you and your husband! Thank you! It is certainly very exciting right now! I know right? Anything is better than the first trimester, when the wait looks to be too long and you aren't feeling good at all! Hooray! So excited for you! TImehop has been showing me how much I tweeted about being exhausted and napping this time last year--it's a wonder no one figured out I was pregnant then. Hope the rest of pregnancy is a breeze! Aw, congratulations to you guys! Wishing you lots of health and hope you enjoy every minute as you wait for you little one to arrive! Congratulations! What wonderful news! I wish you all the best in this next phase of your life. I love the pic, I have a friend who has a dog almost identical to yours. Congratulations. All the very, very best. Wonderful news! I am so glad you are feeling better now. I was sick the entire time. Blech! Congratulations, Athira! Such exciting news! Congratulations, Athira!! That's so wonderful. I'm so glad you're feeling better now. With my second, I was constantly putting on Beauty and the Beast for my oldest while I lay on the couch feeling nauseous, and to this day, when I hear the songs from it, I still feel a bit nauseous! Congratulations!!! I'm very happy for you. I know, right? I kept thinking that someone is going to ask me if I was pregnant, because to me, the clues were just everywhere! Thank you! I hope the rest of the pregnancy is sans drama and aches!! Thank you so much!! I so wanted to make Rue the main part of our announcement photo, but boy, silly dogs and them not understanding the important of the moment! Oh, what a bummer to be sick the entire time! I had given up on feeling positive by week 9, so I was relieved to have this nausea end. I cannot imagine feeling sick the entire time. One of my cousins and another friend were also sick the entire time and I was feeling terrible for them. Haha, that makes me laugh, but I know what you mean. It is so funny how this memory thing works. Yayyy, congratulations again! I definitely dealt with nasty nausea as well. Like you, when I felt so horrible, I kept thinking that I couldn't wait for June to get here . . . but now that I'm feeling so much better, I'm just trying to soak up this time and enjoy it. I very much understand that fear that something will go wrong, and a hesitancy to "go public" . . . but the odds are in our favor, and I keep reminding myself to choose happiness now. Wishing you lots of feel-good second-trimester vibes! Aww, huge congrats to you! I am so glad to hear that you're feeling better. I LOVE the picture of the dog... I wanted a picture of my dog like that too but he is SO uncooperative! My due date is today and we're still waiting... crazy little babies! Congratulations! I'm so glad you're feeling better and hope you genuinely enjoy your pregnancy. Congratulations! Very exciting! 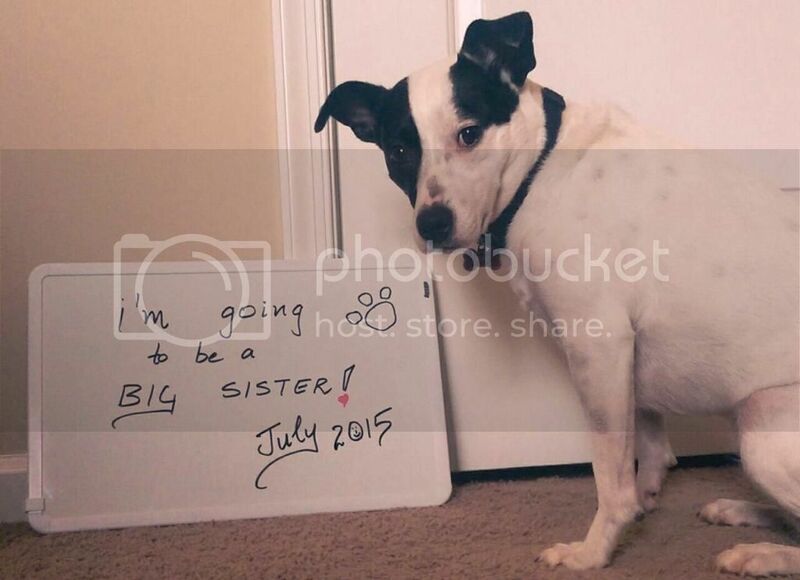 Adorable announcement, too! This summer baby has made me hate winter now. And I used to like winter somewhat. Oh well, no complaints. It's a good time to be born - at least we can be out a lot. It took us a long time to get that photo. Our dog just couldn't understand what we were trying to do, plus we had to tempt her with treats and toys, lol! Thank you! I hope everything goes smooth! Thank you! I'm glad the nausea is behind me! I know, right? There are a lot of bloggers I know currently expecting or who just had babies. I am a July baby too, so I had very few people at my birthday party too. That part always bummed me, but oh well! Thank you for the wishes. OMG OMG OMG OMG OMG Congratulations! I'm so totally thrilled for you!!!!!!! !